RAYTOWN, Mo. -- Raytown Police made an arrest Monday in connection with threats made against the district. Police began investigating a possible threat to Raytown schools after a post on Snapchat Sunday. 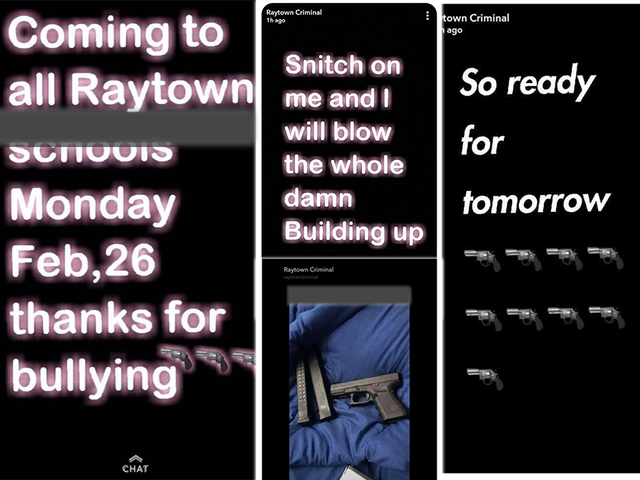 The image originally posted to Snapchat and later shared on other social media says "Coming to all Raytown schools Monday, Feb, 26 thanks for bullying (sic)," followed by three gun emojis. The Raytown Police Department said they received hundreds of calls about the photo. Police said they took a 14-year-old girl into custody. The girl did not attend school Monday or ride the bus, according to a police release. The girl allegedly used images of firearms from other social media posts outside of Kansas City, and police don't believe the girl actually possessed any of the firearms. When questioned by police, the girl told investigators she made the threat because she didn't want to go to school Monday. Because the credibility of the threat had not yet been determined by the start of the school day, many parents chose to keep their kids at home. Brandi Drumheller kept her 5-year-old daughter at home. "For me, it was I didn't want to take the chance, and I felt more comfortable with her home and not having to worry about her all day," Drumheller said. Britny Lamb and her husband made the same decision, keeping their six and nine-year-old students at home. "This may have just been a student that wants the day off school or thinks that they're being funny, or it could have been something horrible, and we're not willing to take that risk," Lamb explained. Some parents said they believed their children were safe because they didn't think the original poster would act on their words. "If something gets posted on social media, the likelihood is nothing will happen. If you go back to all the shootings, nothing is said on social media. I know that my children are safe in the schools," Debrah Mixon, mother to multiple Raytown students, said. Other parents felt the same but had to reassure their children before sending them to school Monday. "I try to tell her that most of the times when these things are posted, it's not the people who post the things that you worry about, it's the people who don't," Ed, who didn't want to give a last name, told 41 Action News of his daughter. "She was a little worried about it, and we had to reassure her that everything that can be done is being done." The Raytown School District said 35 percent of students were absent on Monday. The school district told 41 Action News all absences will be excused. "Recent events at schools around the nation have heightened everyone’s concern for the safety of students and staff. I want to assure you that we take any type of threat seriously and have the full cooperation of our local police departments. That policy will not change. Poor decisions like this disrupt the educational environment and cause undue anxiety among students, staff, and families. I encourage you to talk with your child about the seriousness of threats and the importance of reporting suspicious activities, threats or disturbing information to a trusted adult. Students also need to be aware that law enforcement agencies are taking these threats very seriously and are pursuing prosecution even when such incidents are intended as pranks. There is truly no anonymity on the internet; the Federal Bureau of Investigation (FBI) and Snapchat provided the student's full profile of information to local law enforcement. Please make sure your child is aware of these ramifications and that he or she understands hoaxes related to campus safety will not be tolerated. Thank you to the Raytown Police Department, Kansas City Police Department, FBI, the Bureau of Alcohol, Tobacco, Firearms and Explosives (ATF), and Snapchat for your investigation and support of our students. We are grateful to our students, staff, and families for their courage in reporting suspicious activity and working with us to promote a safe educational environment."